The University Of Texas Press has a great idea on their hands. How to sift through the dozens, if not hundreds of books about a really popular artist. 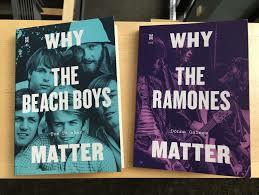 Two books in particular, Why the Beach Boys Matter and Why The Ramones Matter provide an excellent introduction to the bands that just not survived the music industry, but electrified and revolutionized it long after their biggest releases took hold on the world. Of all the white American pop music groups that hit the charts before the Beatles, only the Beach Boys continued to thrive throughout the British Invasion to survive into the 1970s and beyond. The Beach Boys helped define both sides of the era we broadly call the sixties, split between their early surf, car, and summer pop and their later hippie, counterculture, and ambitious rock. No other group can claim the Ronettes and the Four Seasons as early 1960s rivals; the Mamas and the Papas and Crosby, Stills and Nash as later 1960s rivals; and the Beatles and the Temptations as decade-spanning counterparts. The author, Tom Smucker, has written about pop music and politics in publications such as Creem and The Village Voice, and he used his experience as a perfect opportunity to reflect on a pivotal period in music history. This is the first book to take an honest look at the themes running through the Beach Boys’ art and career as a whole and to examine where they sit inside our culture and politics — and why they still grab our attention. As for Why The Ramones Matter, well, that’s a silly question, right? But the book’s author Donna Gaines, who has written for Rolling Stone, MS, the Village Voice, Spin, Newsday and Salon, is as close to the scene as anyone – Gaines grew up in Rockaway Beach, Queens, a surf town made famous by the mighty Ramones. Her work has been published in fanzines, trade and scholarly collections, journals and textbooks. The central experience of the Ramones and their music is of being an outsider, an outcast, a person who’s somehow defective, and the revolt against shame and self-loathing. The fans, argues Donna Gaines, got it right away, from their own experience of alienation at home, at school, on the streets, and from themselves. This sense of estrangement and marginality permeates everything the Ramones still offer us as artists, and as people. Why the Ramones Matter compellingly makes the case that the Ramones gave us everything; they saved rock and roll, modeled DIY ethics, and addressed our deepest collective traumas, from the personal to the historical. You can get Why The Beach Boys Matter here and Why The Ramones matter here and here.